enabling a more joyous and intentional prenatal experience." "We thoroughly enjoyed listening together to the three part series in preparation for our birth. Becky's insights and positive suggestions empowered us with information and conversation enabling a more joyous and intentional prenatal experience. The series provided us with better information to consult our doctor which otherwise we would not have thought to ask. The guided imagery and affirmations proved a wonderful calming resource. We are grateful for all of Becky's guidance and support." Becky was indispensable with her solid advice via telephone." "I had heard of doula services prior to my pregnancy, but I never thought I'd be so lucky to find a doula who I could also call on as a friend! My husband is active duty military, and we opted to stick with the conventional military healthcare plan which required us to deliver at our local base hospital. The military hospital that we were assigned to had very limited prenatal education, and we were so fortunate to have Becky's guidance in our preparation for our firstborn. Becky came to our home and conducted an in-depth prenatal education consultation. She was so well prepared, and asked so many questions of us. Becky is a wealth of knowledge, and she clearly has a passion for her craft. Despite how well-informed and experienced she is, Becky doesn't overwhelm you with statistics or details. Instead, she's really interested in getting to know you as people and your preferences for your birth. Talk about individualized service! She shared some easy and helpful techniques for Carl to help me through labor. She talked us through the various phases of labor, delivery, and breastfeeding. She kept me calm, assuaged my fears, and offered to stay on-call for us through our pregnancy and after. Since we were quite a far drive from the hospital, I needed sound advice on when to drive so we wouldn't be turned away. Becky was indispensable with her solid advice via telephone, from how to manage during contractions, to laboring positions, from contraction frequency to when to drive, Becky knew just how to talk to a woman in labor, and her words were soothing, informative, and encouraging. I couldn't be more thankful to have Becky's effervescent support, knowledgeable intuition, and gentle spirit guide us through our first pregnancy. enabled me to move into this new stage of life with confidence and grace." "Becky met with my husband and I to walk us through what we might encounter in labor and delivery and teach us techniques we could use during the labor process. From the moment we sat down, it was clear that Becky is very knowledgeable and has had a lot of experience. 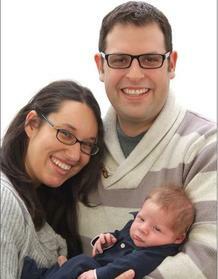 Becky was extremely receptive to all of our questions and concerns, and was open to the birth plan we had chosen. In addition to providing us with an educational session, Becky was available throughout my pregnancy and labor to answer questions and put things in perspective. It really felt like she was with us every step of the way. As a first time mom, this support helped alleviate any anxiety I felt and enabled me to move into this new stage of life with confidence and grace. Becky is a warm, passionate and knowledgeable resource for everything birth related, and I happily recommend her every chance I get." It was incredibly empowering for the two of us to make educated decisions"
"Becky gave us options that we never thought we had, supporting and nurturing us in a way that made our experience so beautiful. We could only hope to have not only a healthy baby but a stress free, positive experience overall, and Becky was a huge force in making that possible. She really listened to what I wanted, challenged my conceptions, was always caring, warm and full of alternatives and ideas. I think I was more relaxed during labor than I am with a 2 month old! 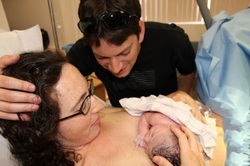 Having a doula allowed us to just focus on labor and our baby, while Becky did the thinking! 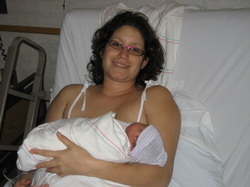 After our beautiful, happy baby was born, Becky was an enormous asset for breastfeeding. Breastfeeding is more than just the act of feeding - having a calm, nurturing person there everyday to support, validate and be a calming force made the beginning experience in breastfeeding enjoyable and started us off on a perfect food for bonding and comfortable feeding. It was incredibly empowering for the two of us to make educated decisions that were the best for us as a result of Becky's presence and knowledge. 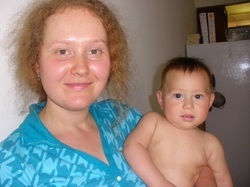 I would not change a thing and just hope that our next child's birth will be so wonderful!" but gave my husband breathing room to be my anchor." "Becky's light was a perfect combination of calmness, warmth, and support for Rhythm's birth. She held my hand every step of the way, but gave my husband breathing room to be my anchor. Thank you Becky for being a part of our support system!" your wants, and knows how to make them a reality"
"I feel very blessed to have had Becky with me during such a momentous time. Having her there for me during labor was an amazing experience. It is a great feeling to know that during possibly the most important moments of both my daughter's life and my own, there was someone there who only cared about how to make the experience the most comfortable and positive for us both. She truly cared about my thoughts, needs and concerns. During the labor and birthing process there are naturally multiple things running through your head at one time and having a doula on your side is like having your own personal advocate - someone who knows your plans, your wants, and knows how to make them a reality in a time that feels very far from real." phone call, check in, or email, I knew I made the best choice." “I am relentless in my quest for information whenever I encounter a new experience. I quickly learned the statistics: having a doula present at your birth greatly increases the opportunity for a healthy, natural birth. Becky was the first doula to return my call. From our first appointment, I felt her warmth and calling to the profession. Her presence put me at ease and with each appointment, phone call, check in, or email, I knew I made the best choice. Becky listens to your needs and supports you in an affirmative manner. She has an intuition that gave me confidence as I was working through the sensations. She was so aware of my body’s needs that she asked if it was time to go to the hospital just as the words left my mouth. Labor is work but it doesn’t have to be painful. There is a distinction between intensity and pain, with Becky’s support I stayed in the intensity/discomfort realm and never experienced pain with laboring or delivery. "She managed to establish that vital unity between doula and mom-to-be"
"She was patient and listened carefully to our objectives, helping us think through the process to avoid a repeat of our first experience.... Becky was glued to my wife, constantly educating, reassuring and advocating.... Brooke and I felt empowered and in control." "I am writing this letter in unwavering support and gratitude for Becky Kopulsky Gerson. My wife and I were introduced to Becky during our second pregnancy. Our first birth, although completely natural, was extremely difficult because of our lack of knowledge and inability to advocate for ourselves. We arrived at the hospital too early and ended up fighting with hospital staff over the length of our labor and our resistance to premature induction. Therefore, with our second birth, we were desirous of a person who would help us through the process and be an advocate for the birthing experience we wanted. From the moment we met Becky, we felt comfortable and excited that she was going to fill that role. She was patient and listened carefully to our objectives, helping us think through the process to avoid a repeat of our first experience. Brooke began laboring in the early morning. Although slow, contractions were steady and we were in constant contact with Becky. Towards the early afternoon, things progressed but everything was still moving slowly. Becky arrived and immediately worked to create a wonderful, loving environment. Her pleasant disposition and wonderful smile was a welcome addition to the moment, a time filled with excitement and anticipation but also trepidation because of our prior experience. Becky got us up and moving. In fact, we were at Whole Foods market shopping an hour prior to our daughter's arrival. It was this type of freedom, reassurance and confidence that Becky brought to the experience. As we approached 5 p.m., contractions were still too far apart to warrent a transfer to the hospital. But then, Brooke had one major contraction, quickly followed by the breaking of her water and then a strong sensation to push. Clearly, things had moved much more rapidly then we expected. Knowing that we would never make it to the hospital in rush hour traffic, Becky advised that we call the paramedics. Within minutes, our living room was swarming with members of the fire department. By this time, Brooke was ready to push and deliver our child. Amazingly, Becky never left Brooke's side, constantly reassuring her, rubbing her and helping her act confidently through every stage. The paramedics wanted to move Brooke to the hospital to deliver the baby. As they tried to move her, my wife resisted. Again, Becky was a constant aid, reassuring and helping us stay in control of our birth, making sure that we knew our options and maintained the birthing experience we talked about even in the midst of chaos. It was only a few seconds later that the paramedics realized that our daughter was crowning and that they needed to deliver our child right there in our living room. All the while, Becky was glued to my wife, constantly educating, reassuring and advocating. 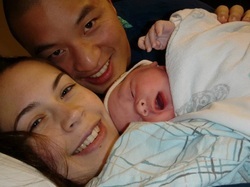 Within minutes, our daughter was born on our living room floor! The experience was intense but it was also our best birth to date. Not just because it is a great story to tell, but because Brooke and I felt empowered and in control. 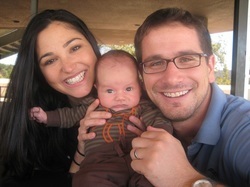 Since the birth of our daughter Ariela, we have gone on to have two more children for a total of 4. 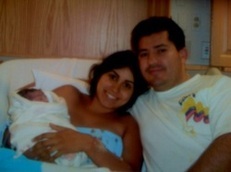 By far, Ariela's birth was our best. It was in part because of this powerful experience that we went on to have two more children to create our wonderfully large and beautiful family. Without Becky, that second birth may have turned out very differently. Laurence Rosenthal - Husband to Brooke Rosenthal; Father of Avram Eli, Ariela, Ma'ayan and Naftali." "a support system other than just medical"
during what can seem like such a traumatic experience." a soothing and relaxed atmosphere helped me greatly." 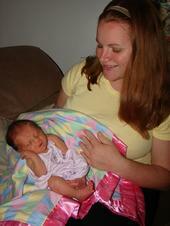 "Becky was a tremendous presence at the birth and during labor. Her level of empathy and her ability to create a soothing and relaxed atmosphere helped me greatly. 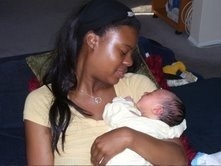 I couldn't imagine having such a pleasant birthing experience without her." "very attentive and helpful, yet not intrusive"
"Becky was very attentive and helpful, yet not intrusive to husband's involvement, nurse's care, or my services."